The Monastery of Koutloumousiou is located on the north-eastern side of the peninsula, near Karyes. It is sixth in hierarchical rank among the monasteries. While the existence of the monastery is confirmed by document from 1169 (founded by the Greek Emperor Alexey Komnin), Koutloumousiou Monastery was founded in its present form in the 14th century. Its central church was built in 1540. It is considered to be one of the most magnificent of all the monasteries of Mount Athos. The central church was built in 1540, but there are many chapels associated with the monastery. The most impressive of these is the chapel of the Protection of the Mother of God, built in 1733, which is at the left of the eso-narthex of the central church and contains a wonderworking icon of the Mother of God holding Christ as a child. Other chapels include St. Natalia, Ss. Kosmas and Damian, All Saints, St. John the Baptist, the Archangels and St. Spyridon. Koutloumousiou's library contains 662 manuscript codices and 3500 printed books. 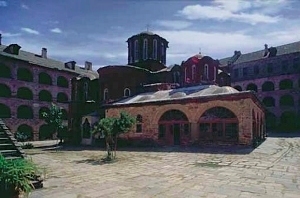 The Greek skete of St. Panteleimon belongs to Koutloumousiou, and is very close by. The icon of Theotokos which is in the chapel of the monastery. 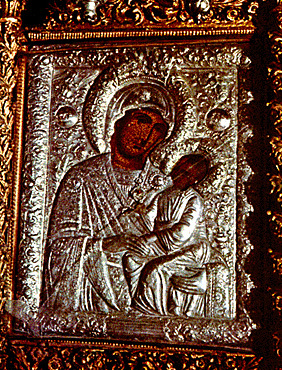 The icon depicts Theotokos holding Baby Jesus in her left hand. On the right side of the icon there is an Angel holding a cross, a spear and a cane. The prophets are also depicted there. St. Efstathios hand, part of the right leg of St. Anna (Theotokos mother), St. Marina’s finger, hand and a part of St. Charalampos jaw.